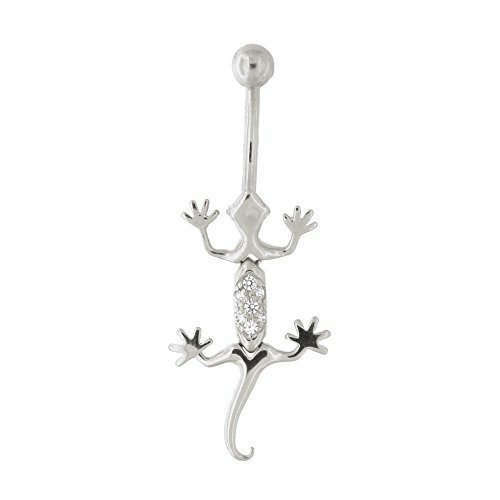 This dangling belly ring is made from 14k gold and cubic zirconia. Our cubic zirconia is bright and clear with an unmatched sparkle, so it will easily convince others it's the real thing. 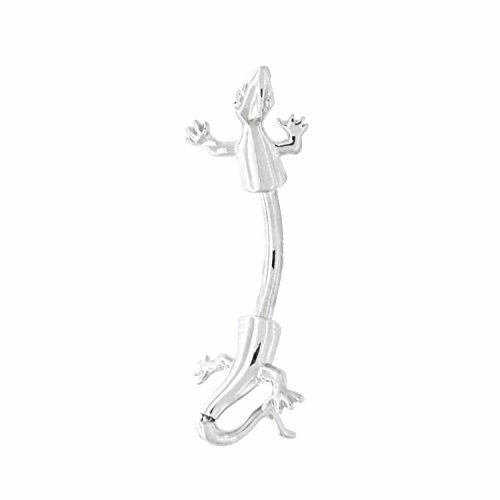 This navel ring measures 43mm (1 6/8 in) long and is 17mm (6/8 in) at the widest point. The top ball measures 4.5mm (3/16 in). The barbell is 1.6mm thick (14g). 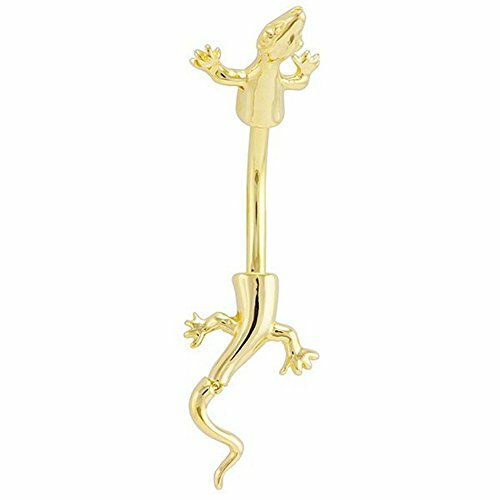 The piece of gold body jewelry weighs 1.9g.About GoldPure gold (24 karat) is a very soft metal. In order to make it into durable jewelry you can wear everyday, it is mixed with other metals to add strength. The most popular alloy of gold is 14K gold, which is 58.5% pure gold and 41.5% other metals like silver and copper. Adding other metals to gold also allows us to make beautiful gold variations like white and rose gold.Gold Jewelry CareTo clean your gold jewelry, soak it in a bowl of mild liquid detergent and lukewarm water. Then rinse with water and dry with a soft cloth. Be careful not to bend any prongs while cleaning, as this could loosen stones from their settings. We recommend storing your gold jewelry individually wrapped in soft cloth to protect it from being scratched. 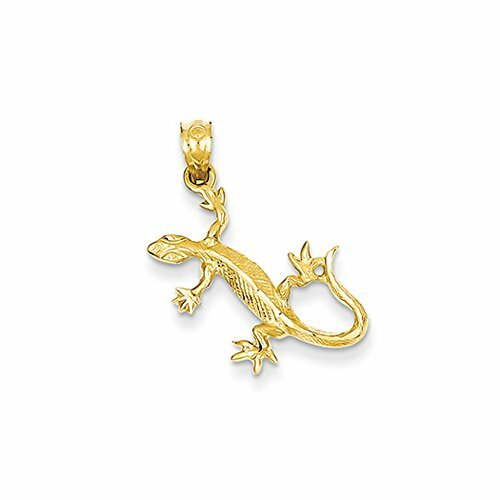 As a symbolic symbol, meaningful totem, or just because you love lizards this polished earring is a tropical delight. 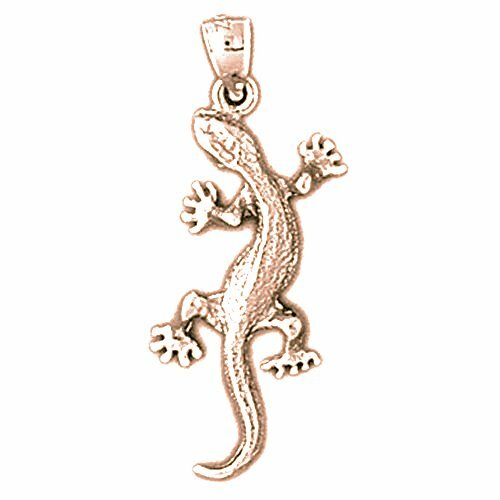 Fashioned from 14k yellow gold with a friction-back post, it is approximately 7mm (1/4 inch) in width by 12mm (7/16 inch) in length. Made in the U.S.A. 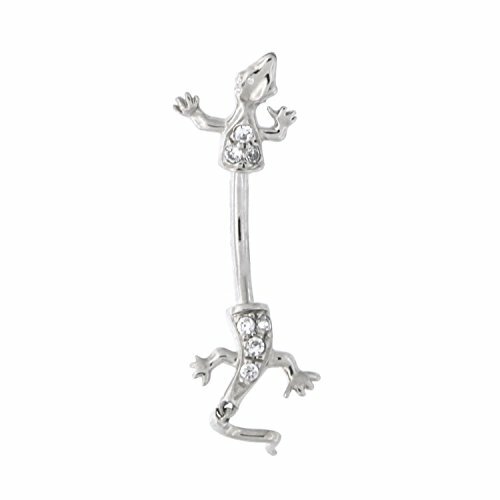 This split belly ring is made from 14k gold and cubic zirconia. Our cubic zirconia is bright and clear with an unmatched sparkle, so it will easily convince others it's the real thing. This navel ring measures 35mm (1 3/8 in) long and is 10mm (3/8 in) at the widest point. The barbell is 1.6mm thick (14g). The piece of gold body jewelry weighs 1.4g.About GoldPure gold (24 karat) is a very soft metal. In order to make it into durable jewelry you can wear everyday, it is mixed with other metals to add strength. The most popular alloy of gold is 14K gold, which is 58.5% pure gold and 41.5% other metals like silver and copper. Adding other metals to gold also allows us to make beautiful gold variations like white and rose gold.Gold Jewelry CareTo clean your gold jewelry, soak it in a bowl of mild liquid detergent and lukewarm water. Then rinse with water and dry with a soft cloth. Be careful not to bend any prongs while cleaning, as this could loosen stones from their settings. We recommend storing your gold jewelry individually wrapped in soft cloth to protect it from being scratched. This split belly ring is made from 14k gold and stamped "14k". This navel ring measures 35mm (1 3/8 in) long and is 10mm (3/8 in) at the widest point. The barbell is 1.6mm thick (14g). The piece of gold body jewelry weighs 1.4g.About GoldPure gold (24 karat) is a very soft metal. In order to make it into durable jewelry you can wear everyday, it is mixed with other metals to add strength. The most popular alloy of gold is 14K gold, which is 58.5% pure gold and 41.5% other metals like silver and copper. Adding other metals to gold also allows us to make beautiful gold variations like white and rose gold.Gold Jewelry CareTo clean your gold jewelry, soak it in a bowl of mild liquid detergent and lukewarm water. Then rinse with water and dry with a soft cloth. Be careful not to bend any prongs while cleaning, as this could loosen stones from their settings. We recommend storing your gold jewelry individually wrapped in soft cloth to protect it from being scratched. 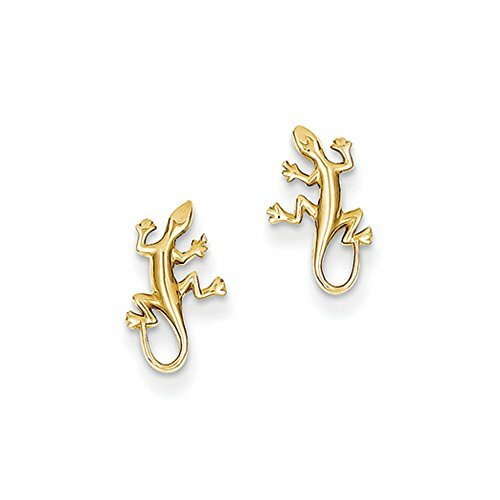 Looking for more 14k Gold Gecko similar ideas? Try to explore these searches: Signal Side Marker Light, Jump Bouncer, and Mini Angle Head. 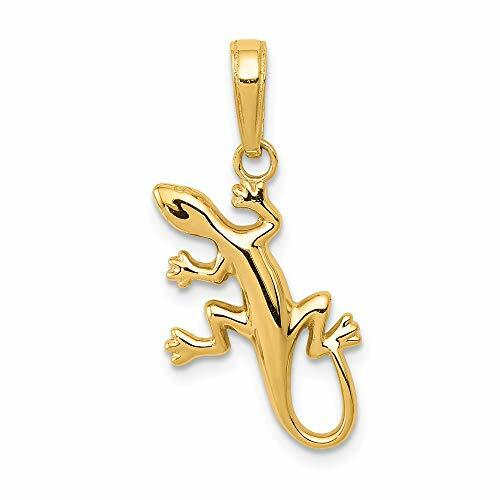 Look at latest related video about 14k Gold Gecko. Shopwizion.com is the smartest way for online shopping: compare prices of leading online shops for best deals around the web. 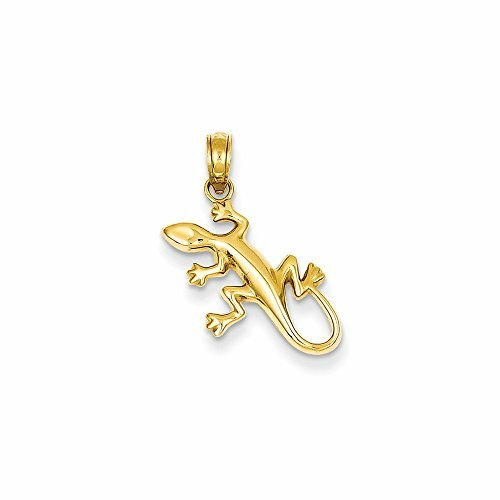 Don't miss TOP 14k Gold Gecko deals, updated daily.